The Installation Dinner held on 2nd. 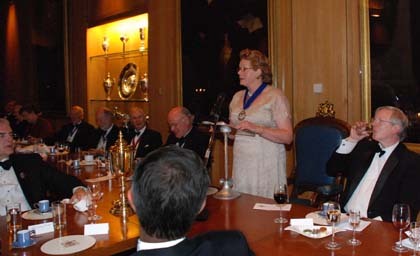 October 2009 at the Haberdashers’ Hall, was a very special and historic occasion at which members of the Livery were able to welcome the first Lady Master of the Feltmakers’ Company. 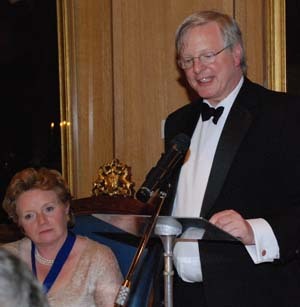 Liveryman Nicholas Hilliard QC in a very amusing speech welcomed the guests – the Masters, Upper Wardens and Upper Bailiffs of the Haberdashers, Tallow Chandlers, Weavers, Makers of Playing Cards and Watermen & Lightermen and their Clerks. lady Upper Bailiff of the Weavers Company after 900 years and compared it to the indecent haste of the Feltmakers to only take 405 years to install our first Lady Master! 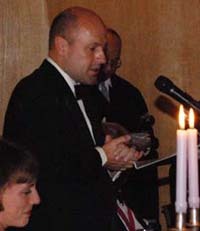 He also welcomed the Principal guest Jonathan Ruffer and proposed the toast to the guests. The Master thanked the outgoing Master, Nicholas Heal for a marvellous year which had been carried out with such energy and enthusiasm and would be a hard act to follow. She welcomed the new Fourth Warden and Commander Rory Bryan who updated us all on the activities of HMS Lancaster and its forthcoming deployment. She referred to the Company’s relative success in the Inter Livery Tennis tournament at Queen’s Club and hoped that the improvement could be sustained in 2010. She also congratulated Past Master Geoffrey Farr MBE and Liveryman Michael Burgess OBE on receiving honours in the Queen’s Birthday List. The Feltmakers’ Company has strong family traditions which have been passed down over many generations namely the Wontner, Christie Miller, Bowler, Keen and Burgess families. 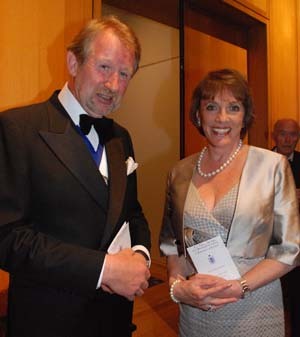 Indeed it was splendid that the descendants of those families were present at the Dinner some 216 years after Sir Thomas Wontner was Master of the Company. The Master’s theme for the year is membership emphasising that it is important like any club or society to be invigorated by new members. She outlined the events for the first few months of her year and hoped that as many Liverymen as possible would attend. Jonathan Ruffer who had known the Master as business colleague in investment management responded in a delightfully amusing speech on behalf of the guests. He commented on the warmth of the Company and the support for the new Master. He portrayed the relationship of the Feltmakers’ with the Haberdashers’ Company and that in 1604 they were probably angry with each other! He had worked with Mercury Asset Management which had been named after his boss Henry Grunfeld, (Hg being the chemical symbol for mercury), and noted its relevance within the hatting industry – mad as a hatter! 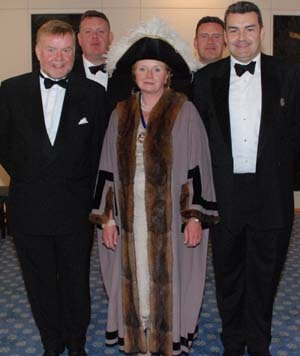 He then proposed the toast to the Worshipful Company of Feltmakers and the Master.